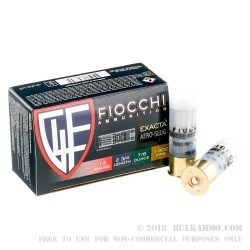 From their Law Enforcement line, Fiocchi 12ga Rifled Exacta Aero Slug rounds will stop anyone in their tracks. They feature a 1 oz slug and attached wad that is designed for stabilized flight and accuracy. Recoil is on the lower end allowing for faster target sighting and firing. 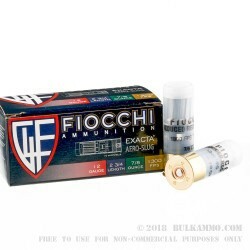 Packed with their custom powder blend and 616 primer, these Fiocchi shells are reliable and provide consistent performance with every shot. Fiochhi ammunition is primarily manufactured in their plant in Ozark, Missouri, right here in the good ol’ US of A. However, due to the popularity of their ammo, they are having to import components and ammo from their factory in Italy to keep up with demand. We think that’s great! Founded in 1876, the Fiocchi family has had their eye on the ball and never let their American dream escape them. Now they are a fantastically successful multi-country ammunition supplier and manufacturer. They have won awards, certifications and been noted for having helped Olympians win with their ammo. Fiocchi Exacta Rifled Aero Slug loads are designed for rifled barrels to provide tighter, more accurate shooting time and time again. Shooting rifled rounds in a smooth bore barrel is possible, however you won’t receive the pin point precision and accuracy of the specifically designed shells. You will receive 10 rounds per box. 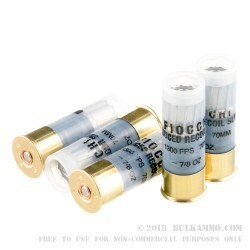 Unloaded shells measure 2 ¾ “. Aero slugs are 7/8 oz.